US, 1998, 89 minutes, Colour. Ken Olin, Mariska Hargitay, Gina Philips, Holt Mc Callany, Wendell Pierce. The Advocate’s Devil has an amusing play on words. However, they are true in this film, based on a novel by celebrated lawyer Alan Dershowitz, who was played by Ron Silver in the Claus Von Bulow film, Reversal of Fortune. The novel has been adapted for a short telemovie, effective nonetheless. 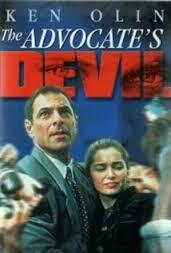 The focus is on the lawyer, played by Ken Olin (30 something and director of a great deal of television). His assistant and partner is played by Mariska Hargitay. The basketball player is played by Holt Mc Callany. The film raises issues of lawyers wanting to win and get a reputation, celebrities presuming on their fame to get away with crime, sexual violence against women, and the use of the Internet to get background information and exploit it. The film was directed by Jeff Bleckner, prolific television director for four decades. 1. The word play on the title? A film about law, justice, morality, truth? 2. The film based on a novel by Alan Dershowitz? Dershowitz and his work, reputation, appearance in Reversal of Fortune? His legal experience? 3. The American City, sports, the law and firms, apartments, business? Credible setting? the beginning of the encounter, the editing cut? Audience presumption? For him, against Jennifer? 5. Her accusations against Campbell? The publicity? The information about her previous case and its being dismissed? 6. Abe, his reputation as a lawyer, recent failures? The death of his wife in an accident? His relationship with Rendi? Emma, her age, talking with her father, asking about Rendi staying over? The contact for the Campbell case, the interview with Joe, seemingly open and shut, his accepting? 7. His working with Rendi, her suspicions? The Internet, documentation about cases, Jennifer’s case? Joe and his not being open with the truth, about his Internet investigations, the inconsistent dates? The further evidence against him? Rendi and her interview with Joe’s wife, her reluctance, indications of violence, impotence, sexual fantasies? The contact with Darlene, her not coming forward until the case was with the jury? 8. Abe, his coming to see the truth about Joe, his legal obligations, to defend him, in the sense of his right to a defense? In the court, his harsh cross-examination of Jennifer, humiliating her? Joe and his eyeing the head of the jury, her response? 9. Justin, his character, work with Abe, with Rendi, getting the information? Supportive but wary? 10. The verdict, Abe avoiding the press? His advising Joe to get therapy? This advice being used in Joe’s next trial? 11. Emma, going to college, Abe and Rendi going with her, his being protective, Rendi being sensible? Emma and her bonding well with Rendi? Emma meeting Joe, being charmed by him? His message for her birthday, flowers, the phone call, arranging the dinner, Emma going out with him, telling Zoe, not telling her parents? The seduction, going to his room? His giving the information about her mother’s death? Her reaction and wanting to get away, Joe’s brutality? Joe asking the police for help? Searching? Phone call to Zoe? Arriving just in time? 12. Further revelations about Joe, his taunting Jennifer, her experience with the company, sexual activity requirements? Her loss of credibility? previous cases and credibility, his going to visit her father and his suspicions being confirmed? 14. The Joe in court, his defense lawyer approaching Abe? Emma and her reaction against Joe, against her father, the puzzle of her mother’s death, clash with Rendi? Her later realising that she understood her mother and that her mother did not know about the affair, did not kill herself? Her going to the court, her father setting Joe up, the reconciliation with her father? 15. Abe discussing with the prosecutor, the president, Abe on the witness stand, the judge’s permission to give the evidence against Joe? 16. Joe and his background, marriage, celebrity, working with the children a basketball, yet his other life, need of psychological help, sexual brutality? 17. Questions about law, morality, the defence of criminals, the guilt, their being released, the dangers?